The full title of this unusual 3D slots game by BetSoft is Miles Bellhouse and His Curious Machine, but that’s a bit much to display in bold letters on a slot machine’s small marquee. So I guess BetSoft simply settled on the shorter title above for general use. The extended title, however, has not impeded the game’s popularity or its ability to attract high profits. A young geeky inventor and the time machine that takes him back in time paint an accurate picture of this game’s theme. Despite the game’s peculiar title, the designer did not spare any gold coins when developing the game’s symbols, icons, gameplay strategy, 3D graphics, sound effects or soundtrack. They all fit together quite nicely like hand-sewn silk gloves. The scenes are so dramatic and impactful that you sometimes have to pause and decide whether you want to have fun to play slots or just relax and be entertained as if you are watching your favorite TV episode. I opted to do a little of both. The play screen is comprised of 30 paylines on a 5-reel grid that sits atop a 3D backdrop which changes depending on your current play activity. The game contains standard features found in most slots, like Wild symbols, Scatter icons, and Bonus Spin symbols. But it takes many more elements to flesh out the game’s funky time machine theme, such as a city in the future; a trusty assistant to the nerdy inventor in the form of an Autobot; the game’s antagonist who is represented by a cantankerous general; the mandatory clock on the wall (this slot is about a time machine, right? ); lots of time machine controls; and the main character, Master Miles Bellhouse in living 3D Technicolor. The game also contains a Bonus Vortex Wild icon that replaces all other icons to help the player create winning combinations for extra prize coins. If you are going to go back in time you may as well do it to the maximum. Therefore, we also have a Dinosaur, and why not? How else would you be able to prove to your skeptical science colleagues that you actually went back in time? Picture this inquisition before the local scientific Institute of Horology. “So, Mr. Bellhouse, you posit that you traveled back in time in a machine you designed, is that right? Do you have any proof of your travels, sir? Millhouse signals to the doorkeeper to open the door and as the door slowly screeches open the Dinosaur walks in. Case closed. But I digress. The Dinosaur symbol unlocks the Blast to the Past Bonus Round. More on that later. A third Bonus Symbol is the control panel for the time machine. With the theme sufficiently set, we take a look at the various versions of The Curious Machine Slots, starting with the real-money edition. This version can be played online by navigating to any of the BetSoft online casinos. Additionally, the free edition lives on many sites on the web. For the play-for-real-money edition, you’ll have to register at an online portal, make a real money deposit, and pick up your Welcome Bonus, which floats between NZD1,000 and NZD1,500. Be sure to read the Terms & Conditions before pushing the Spin Button. A well-informed gamer is a happy gamer. You may want to warm up using the free version for a few rounds before risking real money. Try it before you buy it, right? Start the game by first selecting the number of coins you wish to bet on each active payline. Once you’re satisfied with the scope of your bet, press the Spin button to put the reels in spin mode. Each time you win coins or some other prize, Bellhouse and his Autobot companion jump with joy and over-the-top excitement. Their loyal support is enough to make you really get into the game. For the high rollers and deep pocket gamers, there is a dedicated Max Bet button to allow a sort of cruise control to betting the maximum amount of coins on each of the 30 reels without having to waste time doing the routine task of setting the same bet amount on each reel one by one. 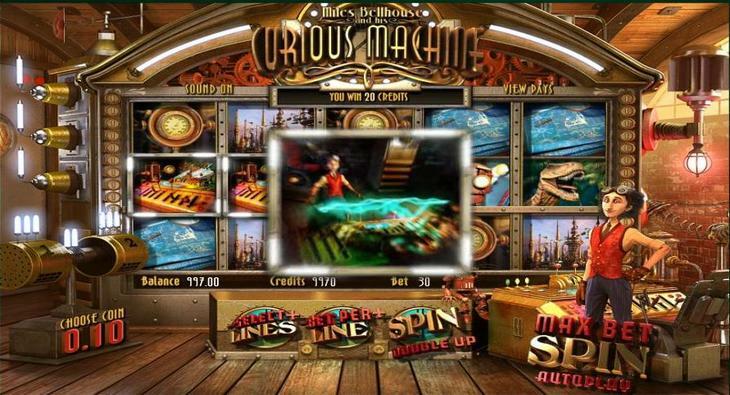 The Rewind feature, the Blast to the Past, and the Travel Through Time are the three Bonus Rounds in The Curious Machine Slots game.The Reel Rewind Bonus Feature is randomly unlocked after a spin that fails to generate a single win of any kind. Think of it as a consolation prize. It simply rewinds the spin and gives you another chance to throw the ball, so to speak. Up next is The Blast to the Past Bonus Round. It is generated when at least 3 Dinosaur icons land anywhere on your screen. For that lucky happenstance you get up to 3 free spins, plus the multiplier will multiply each of your bets by 5x. The Time Machine Controls are very important because if at least 3 of them land anywhere on the grid, they will spring The Travel through Time mechanism into gear. That alerts Bellhouse and the Autobot that it is time to jump into the time machine and travel through time, thereby escaping from the wicked General. How far back in time Bell house and the Autobot are able to travel directly affect your earnings. The Bonus coins that you win for activating this feature start with 200 coins and go up to 1,500 coins. I imagine that the moment in time represented by the 1,500 coins figure must be the symbolic pickup spot where the Dinosaur climbs on board the time machine. The Vortex Wild icon functions the same as the Wilds in most poker games. It also plays a critical role in helping the gamer win more coins and get more Bonus Spins. It does that by substituting itself for any other symbol on the screen in an attempt to help players make more coin-generating win combinations. Bringing up the rear is the Double Up tool. This tool allows you to double up your winnings by multiples of 2 as long as you win on each successive spin you take. If you bet on all 30 available paylines, the game gives you the option of guessing which hand the Autobot is holding the dice. If you guess correctly, your entire wager is doubled. If you guess incorrectly you are sent back to the main game. Now that’s what I call getting a break. In many slots games that have a Double Up feature, if you guess wrong, you lose all your accumulated coins for that particular bet round! That would really knock you back in time. I really like this game. It’s not too hot and not too cold. It has some unique features like the Autobot and the Vortex Wild. And I like the family-friendly Double Up feature that doesn’t take all your coins if you failed to guess the correct hand the robot is holding the dice. How nice. Presently this BetSoft version of The Curious Machine Slots is not quite ready for Prime Time because it is not mobile device friendly. I guess the game makers are still stuck back in time — somewhere prior to the digital revolution of the 1990s.